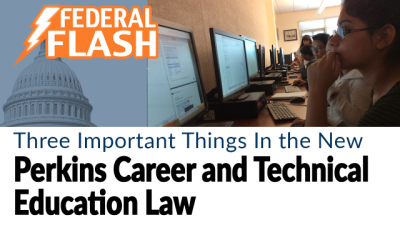 In this week’s Federal Flash we’ll tell you three important things in the new federal career and technical education (CTE) law that is on its way to President Trump’s desk. We’ll also review the Education Department’s proposed new rules for the charter school program and a proposal from House Democrats to renew the Higher Education Act. It’s not every week that we have good news to share from Capitol Hill, but we certainly do today. With time running out before members of Congress head home to campaign for the midterm election in August, a rewrite of the Carl D. Perkins Career and Technical Education Act had to happen quickly. Usually the House passes one version of a bill, the Senate passes another, and they meet to work on a compromise of the two versions in a conference committee. Then each chamber passes the compromise bill. That process typically takes a while. This time, the Senate education committee passed its bill in late June and the full Senate raced to pass a slightly modified version of that bill on Monday. On Wednesday, the House passed the Senate’s bill, allowing them to avoid a conference committee altogether and send the bill to President Trump for his signature. This is an example where good politics actually pushed good policy. The Perkins rewrite had been stalled for a while, but the urge to use the rewrite on the campaign trail helped to push Congress to finish the job. And this urge to get something done didn’t just come from Congress. The White House stepped in to move things along, including the personal involvement of Ivanka Trump. First, there is a stronger focus on equity than in current law. For example, states and districts must “continually make meaningful progress toward improving the performance” of historically underserved students. This is the first time such language appears in this law. This won’t trigger improvement requirements based on the performance of historically underserved students like under the Every Student Succeeds Act, but it prioritizes underserved students in a way we haven’t seen before in Perkins. Second, there is a strong emphasis on quality. This law requires more robust measures of progress. Perkins requires states and districts to set performance targets. If states want to modify these targets, the new law requires that the new targets be higher than the actual performance of students for the prior two years. This is very important, because the law eliminates the ability of the Education Department to negotiate measures of performance with states. Three, the new law more effectively integrates and aligns the work of school districts, employers, and postsecondary institutions. This bill encourages more students to graduate from high school with credit toward a postsecondary credential and a work-based learning experience. After President Trump signs the bill—and he has indicated he will do so–the Education Department will need to put in place a process to review state Perkins plans, similar to the nearly completed process of reviewing and approving state ESSA plans. As details become available, we’ll keep you posted. In the meantime, the Education Department issued seven proposed priorities for grants issued through the federal charter school program, including replicating charter schools that serve high school students and using funding to close low-performing schools and reopen them as charter schools. This strategy will sound familiar to many of you, as it was one of the options under the Obama administration’s School Improvement Grant program, although that option was rarely used. The proposed priorities and requirements are open for public comment at this link. Comments are due on August 27, 2018. Finally, House Democrats have proposed an alternative to the PROSPER Act, the House Republican bill to reauthorize the Higher Education Act. It’s called the Aim Higher Act. The hallmark of the proposal is a federal-state partnership that requires states to offer all students two years of tuition-free community college in exchange for federal funding. The bill won’t go anywhere in the Republican-controlled House, but that could change after the midterm elections as Democrats are pushing hard to win the twenty-four seats necessary to give them a majority in that chamber. For more information on the bill, read the fact sheet. This blog post represents a slightly edited transcript of the July 27 episode of Federal Flash, the Alliance for Excellent Education’s five-minute (or less!) video series on important developments in education policy in Washington, DC. The video version is embedded below. For an alert when the next episode of Federal Flash is available, email at alliance@all4ed.org.